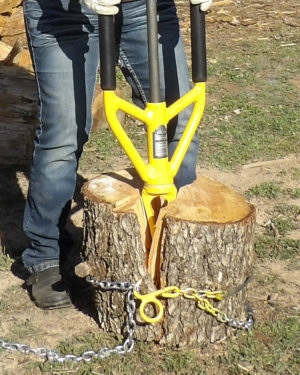 This month has been quite exciting with the video of the Splitz-All wood splitter being viewed on Tractorweb.tv over 15 million times. 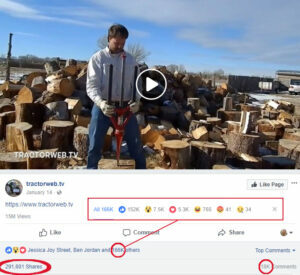 We first became aware that tractorweb.tv had taken one of our older videos and shared it as their own on Facebook at the end of January. This had both benefits and drawbacks to it. 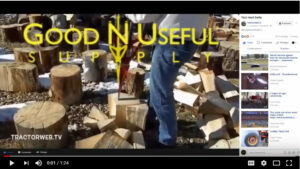 Funny enough this video is of an older model Splitz-all wood splitter and first videos showing the benefits of using the Splitz-all wood splitter to split fire wood. I was just learning to video edit at the time, so the video is one of worst videos we have on our YouTube channel. This goes to show, you don’t have to be perfect and totally professional to get started…just get started and then adjust and get better along the way. Drawback: Since the video was not connected to us nor was there any information to lead people back to us. I opened all notifications to tractorweb.tv’s post and started, what I call, “babysitting comments”. So that if there was anyone interested in knowing where to get the Splitz-all, I was sure to let them know. There for a while “babysitting” became a full time job, continually checking Facebook. I think for the first time in the history of me being on Facebook, did my husband approve and was glad I was on it. LOL. Luckily there are more benefits. Benefit: Tractorweb.tv has the right size and interested community, so when the video was shared, it peaked interest. Benefit: Our friend shared the video with us when it was at 5.2 million views. We have continued to watch, with excitement, as the views increased every day. For about a little over a week, the video was getting approximately 1 million views a day. (On one of our other videos it’s been 1 year and we are almost to 1 million) so 1 million views a DAY, this is something we had not experienced yet, so it was quite exciting. Benefit: We have been able to manage the hiccups that have come since the video went VIRAL, so far. We LOVE the free publicity, (that’s not totally free) I get to put some time in on getting people pointed in the right direction. 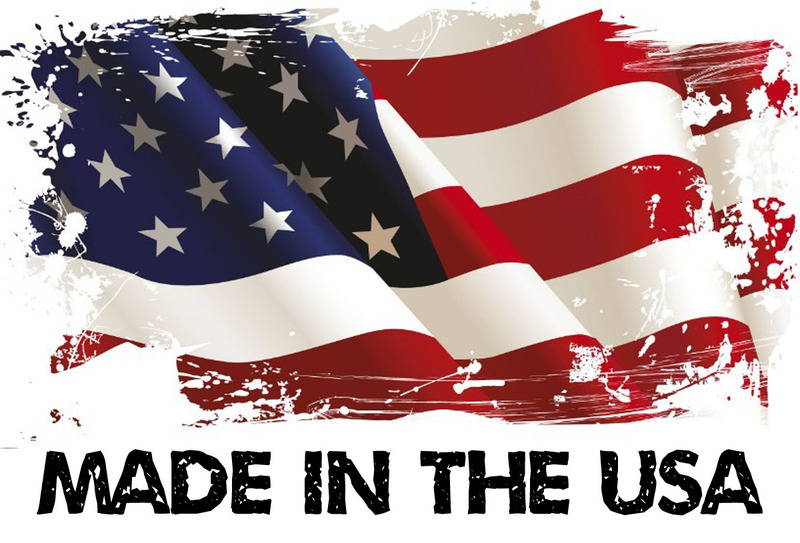 We greatly appreciate the increased interest and sales, Thank you. 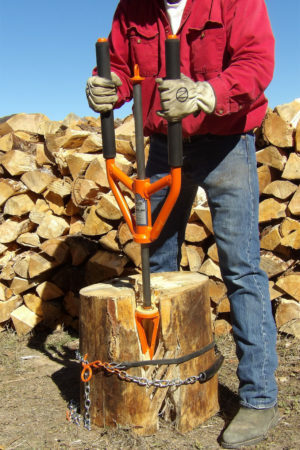 Rufus James Beebe A slide hammer is a great way for anyone with bad shoulder joints to split wood. I used mauls, axes and wedges for decades. Can’t swing axe anymore w/out extreme pain. Robin Changuion – the axe is dead. I recorded Nathaniel showing how to use the Splitz-all and telling about the benefits to using it, but then when I went to create the video, the audio was so bad because of the wind that I couldn’t hear what he was saying clearly. I couldn’t tie Nathaniel down long enough to create a voice over, so I (female) did the voice over. Oh the comments we are getting… “that tool makes him sound like a girl“. “he sure does have a girly voice” “I hope I don’t go feminine by using this tool“, I’m still laughing.